SawInfo from a production perspective. The Kåge Såg sawmill, just north of Skellefteå, is owned by Norra Skogsägarna. This sawmill, which has an annual production of about 170,000 m3, specialises in the manufacture of high-quality spruce and pine goods. Our plant can easily accommodate customisation through drying, planing, finger jointing and other processes. Our raw materials are high-grade pine and spruce from Västerbotten and Norrbotten counties. Kåge Såg has about 75 employees. Kåge Såg has used SawInfo for two years, and has had very positive experiences with it. Per Boman is a production planner, and the person who introduced SawInfo in the production process. “For a couple of years, we were thinking of how we could gain a better overview of how we handled timber packages during storage and loading. We had pretty good control over things even before this, but we were still not completely satisfied. By deciding to invest in SawInfo, we switched to a completely new way of working, which has saved us incredible amounts of time. Today, we have total control over our warehouse where all the timber packages are, and perhaps even more importantly, we handle loading in a much more efficient manner”. "As a production planner I have a much better overview of my work than was previously the case". Per explains that the company’s greatest savings of time and handling are in loading. Not only is the cargo optimised in an entirely new way, but locating the packages to be loaded is also so much faster. 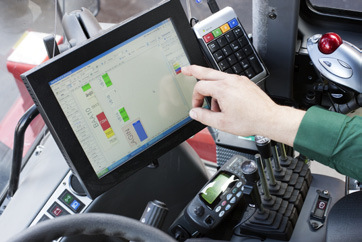 Each forklift truck is equipped with a computer screen that gives its operator total control over where the timber packages are stored. This enables them to take the packages out in advance and put them together in preparation for loading. The operator can also receive messages that a lorry is on the way into the area, and is ready for loading. "All things considered, we now have fewer lorries to load and transport our products. This amounts to a significant annual savings for us." Because SawInfo can be linked to the sawmill’s order, stock and invoicing system, it creates an overview that benefits several functions at the company. "As a production planner I have a much better overview of my work than was previously the case. And the forklift truck operators can easily communicate with, and help, each other when additional efforts may be required at a specific point in production. We can move the trucks and other machinery much faster now within the sawmill area, and this too saves a great deal of time". 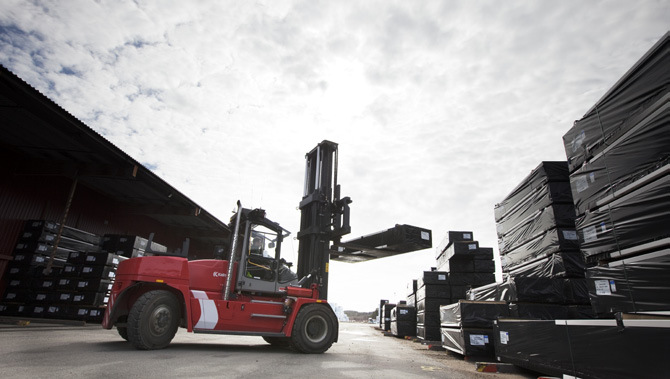 Currently, about 20 forklift truck operators work with SawInfo. They all initially underwent a training course regarding how the program works, but a lot depends on how they teach each other and become better at using SawInfo optimally as a tool to simplify their work, while shortening driving distances. "As all the timber packages are labelled with identification data, we also know the production date of every package. We can prepare lists containing production dates, so we can also ensure that the oldest timber is always delivered first, and is not skipped over". Previously, the forklift truck operators wrote a list by hand of all the timber packages they placed in stock, and then transferred it all to a computer. With this procedure there was always a risk of errors occurring. In addition, at the end of shifts, mistakes could result from the truck operators forgetting to prepare exact reports and give each other correct information. "We have eliminated practically every chance of a faulty delivery". By introducing SawInfo, there is now also complete traceability of every timber package at Kåge Såg. This will make it easier to process complaints, as it is simple to follow a package from the point at which it exits the production line until it leaves the sawmill. 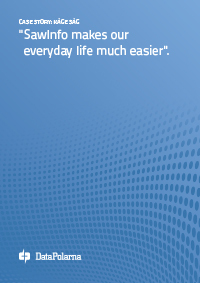 importantly, we handle loading in a much more efficient manner".